Our most comfortable stack chair features ergonomically formed polypropylene seats and backrests for the utmost in comfort plus maintenance free design. The perfectly contoured shape of our premium stackable chair distributes body weight and relieves pressure on the seat and back. Provides comfortable seating for longer durations wherever mass seating is required. SOLD IN MULTIPLES OF 4 ONLY! PRICE IS PER CHAIR. IN STOCK! 300 lbs. weight capacity lab tested for commercial use applications. Steel tube frame has front cross brace support and is completely welded for strength. Chrome finish is durable and attractive in any setting. An ideal choice for any large audience seating such as churches, schools, auditoriums, or any other large meeting or gathering area. Also a good option for the reception area in need of cost effective, comfortable yet durable ganged seating. Preinstalled ganging brackets come standard for organized row seating in your meeting or reception area. Set up is easy due to easy interlocking design. Keeps your large meeting facility orderly, yet simple to tear down and store. 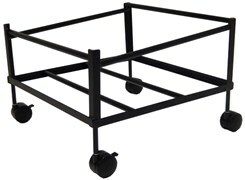 Stackable up to 16 chairs high on convenient mobile chair dolly sold below. ANSI/BIFMA approved. 5-year Manufacturer's Warranty. Seat measures 18"W x 18"D x 18-1/2"H. Back is 18-3/4"W x 16"H. Measures 18-3/4"W x 24"D x 33"H overall. Seats and backrests ship detached - connect with 6 screws per chair. Shpg. wt. 10 lbs. PRICE INCLUDES SHIPPING! (Truck shipment - See Terms & Conditions). 1 - 5 $129.00 ea. 6 - 11 $119.00 ea. 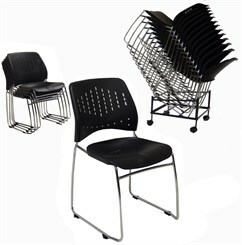 Strong black steel frame holds up to 16 chairs and fits through standard doorway. Measures 24"W x 23"D x 16-1/2"H overall. Shipping weight 14 lbs. PRICE INCLUDES SHIPPING! Temporarily sold out. Available to ship Early June. Order Now!